How To Make A Water Gun! Amazing Homemade Water Cannons, shoot 50? 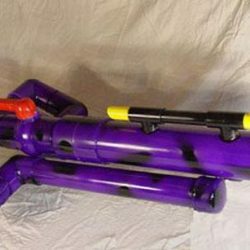 PVC Water Cannon, Inexpensive, fun to build, hours of fun! 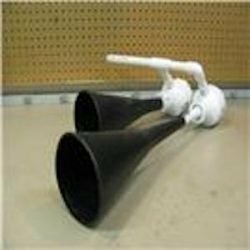 Build your own Homemade Water Cannons, PVC Water Cannon!
? Homemade Water Guns BLOW away any other squirt gun!! COMPLETE PLANS on how to make a water gun! The newest Water Parks have some incredible water guns permanently mounted just for you to use. The nice thing about that is that they never run out of water. They are safe and fun to use and they rarely if ever break. 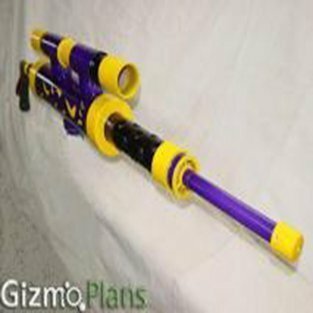 Here is a water gun with all of that in mind and it is fun to build as well. It features a large fun scope which makes aiming fast and easy. It shoots a minimum of 50 feet on low water pressure, much further on high water pressure. It NEVER runs out of water as it connects to your garden hose. It has a swivel mount just like at a water park. It features a quick disconnect swivel base so once your friends learn your water gun range, surprise them and bring the water gun to them. A squirt gun like no other. It has an easy squeeze variable control trigger. It uses only one (long lasting) moving part. It also allows for changeable water nozzles for more water flow. Have a ton of fun with this Homemade Water Cannon! 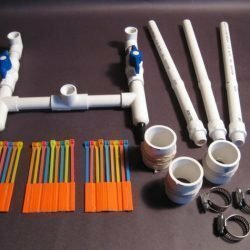 Now you too can build the Water Park Cannon and these plans will tell you step by step how. 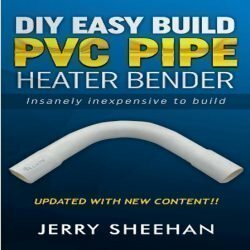 Download plans for only $4.95 and start building today!! These one of a kind plans are designed for low cost and ease of building in mind. Every step is photographed, every action described.